Pulsara has expanded its integration strategy by partnering with iSchemaView, the worldwide leader in advanced imaging for stroke. 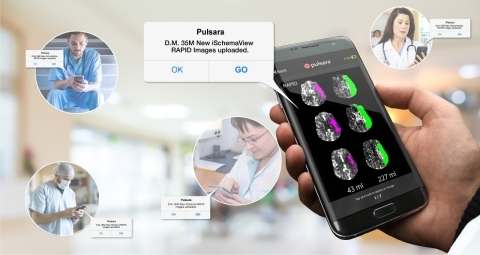 By leveraging Pulsara's open API infrastructure, iSchemaView now streamlines the sharing of its RAPID imaging platform for stroke care collaboration globally. Pulsara’s seamless integration with iSchemaView is a natural fit with Pulsara’s stroke module. As stroke is a time-sensitive emergency, state-of-the-art tools that deliver immediate results provide the best chance of treatment success. The RAPID platform automatically provides clear, easy-to-interpret CT and MRI brain images indicating perfusion and angiographic blood flow abnormalities that identify severely damaged tissue vs tissue at-risk. RAPID is the only neuroimaging platform that is FDA-cleared for selecting stroke patients for endovascular clot removal, also known as thrombectomy.